Come and vacation in luxury at one of North Myrtle Beach's Newest Vacation Resorts which opened in June 2004. This popular two tower luxury oceanfront building located in the Crescent Beach area at 1625 S. Ocean Blvd. offers a 200 ft. lazy river, 110 ft. oceanfront pool, indoor pool heated in winter, kiddie pool, 2 over-sized oceanfront hot tubs and a exercise/fitness room. This complex is not a hotel and all units are privately owned by individual owners.. The building has high speed internet and each unit has a wireless connection. All this and more can be found on the beautiful beach of this year round family resort town just footsteps from the ocean. There is plenty to enjoy in all seasons. Our condos have been professionally decorated and have sturdy dark wood and metal furniture. They have a fully equipped upgraded kitchen with a pantry, new built in microwave (1/2019), new radiant stove top oven (1/2019), breakfast bar, granite counter tops and ceramic tile floors. There is a separate dining area with a side ocean view and the living room with its direct oceanfront views has sliding glass doors that lead to a 27 ft. oceanfront balcony. There is a 32" flat screen television and blu-ray player in the living room. The balcony has a table & six chairs where you can relax while enjoying the ocean breeze and listening to the sounds of the ocean. The master bedroom has a king size bed, a private bath with a whirlpool garden tub, separate shower and a double sink. There is a sliding glass door that leads to the oceanfront balcony where you can take in the spectacular sunrises and sunsets. The second bedroom has two queens. The third bedroom has a king and in the fourth bedroom there are two queens.There is a queen size sofa sleeper for additional sleeping space. The third and fourth bedrooms (Jack and Jill) have a bathroom that connects them. Each bedroom has its own 32" flat screen television. There are also ceiling fans in all the bedrooms, including the living room. All the bathrooms have granite counter tops with plenty of cabinet space and ceramic tile floors. We have a laundry room with a king sized washer and dryer in the kitchen area for your convenience. There is your own large storage room just outside the front door for all your beach items so there is no need to worry about tracking sand into the condo. Also you have plenty of closet space throughout the condo to meet your storage needs. Parking is in the covered multi level parking garage across the street from the condo towers.There is fifteen minute parking under the buildings for drop off and pick up. Parking tags are required which we will provide. Motorcycles, Trailers, RV's & Boats are Not Allowed. Pets Are Not Allowed. Sheets and bath towels are included on all weekly rentals. Linens are not available for longer term rentals. The cleaning service provides a trash bag in each can, a roll of toilet paper in each bathroom and a roll of paper towels to get you started. You need to bring any extras as well as dish soap, dish detergent, laundry supplies, hair dryer, bath soap, etc. We are close to Barefoot Landing, Restaurant Row and a short drive to Broadway at the Beach and many other wonderful Myrtle Beach attractions. We are about 30 minutes from North Myrtle Beach airport. There are many fun things for all ages to enjoy. In addition to this condo we also have another 4ba/3br unit with a similar floor plan in the South Tower at Crescent Shores on the ninth floor (#1083486) as well as two smaller ones in the Windy Hill section. Both units are 2 bedroom 2 bath oceanfronts directly on the beach. One is at Windy Village #25151 and the other is at Windsong #52803 which are only a short two blocks apart. Monthly rentals are available October thru April. From May 25 till August 31 our rentals are weekly and Saturday to Saturday only. Daily rentals are available during the off season months. Our place offers all the amenities of home and so much more. Please give us a call if Crescent Shores is the place for your dream vacation. 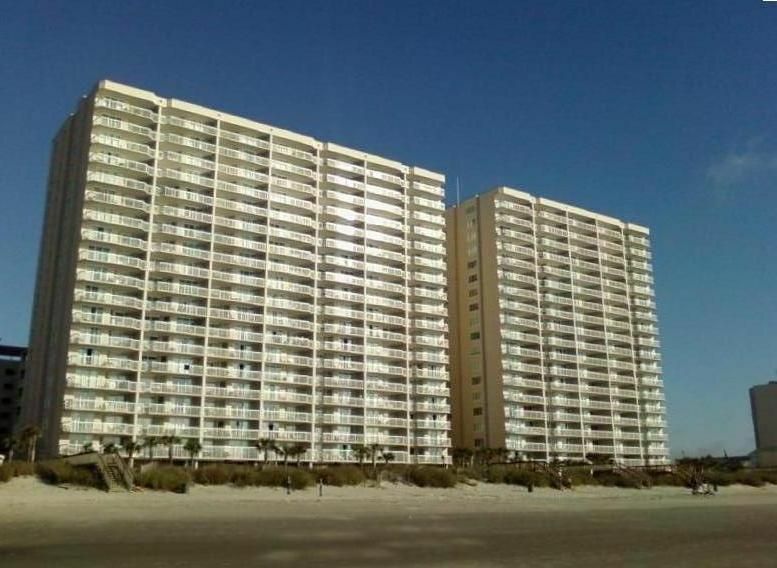 We live in Lansdale, PA and own three other condos in the North Myrtle Beach area. VRBO lisitings 25151, 52803 and 1083486. We love North Myrtle Beach and have been coming there since 1996. We enjoy visiting every year. We love the North Myrtle Beach area and Crescent Shores has everything you need to have a wonderful vacation. Crescent Shores has indoor and outdoor pools, hot tubs and kiddie pool. There is a lazy river that everyone enjoys and there is a fitness center. The beach here is beautiful and the views from the condo are excellent. There is a master bath in the master bedroom, a bath in the main hallway of the condo and a jack and jill bath that connects the third and fourth bedrooms. The cleaning service supplies a starter roll of toilet paper in each bathroom. You will need to provide any extras and your own bath soap, shampoo and hair dryer. The cleaning service supplies a starter bag in each trash can, a roll of paper towels and a starter roll of toilet paper in each bathroom. You will need to bring any extras if needed. Departure Cleaning, Sheets and Bath Towels included. Beautiful condo and stunning view!! We LOVED this condo! It’s absolutely beautiful inside and very roomy. Very clean and well maintained. The unloading area of the condo, along with the luggage carts were very convenient. Our truck was too big for the parking garage, but there was close parking right around the back of the garage, which was nice! There’s even a little storage area right outside the room for you sandy beach stuff. The owners were great to work with and were very accommodating. We had to leave early due to a hurricane, but they were so kind, helpful, and quick to respond and refund the days we were required to evacuate. We would DEFINITELY recommend this place and would absolutely come back! Thanks Michelle and Dennis!! We went with family and friends and we cannot expect more. We love the place, the view... everything. Great for large family vacations! Thank you for the feedback. We are glad you enjoyed your visit and will have our maintenance man take a look at the lights in the bathrooms. We have spare bulbs in the laundry room and master bathroom cabinet that the renters are free to use. We will also bring your suggestion about an information desk up to the Homeowners Association's at the annual meeting this fall. Great week in the condo! We stayed in this condo for one week over the fourth of July. The condo was everything we needed for a vacation with my extended family and four toddlers. Everything was as described and it a great location. They were easy to work with and it was a seamless process. I would stay in their condo again. Great location! We had 8 people. Not crampedat all. Condo in decent condition. Condo in good condition. It’s not brand new but well kept. Lazy river and pool great for kids. We had a very enjoyable family vacation! We all thought the place was great! The owner had provided some Beach accessories such as Beach chairs, umbrellas & kids sand toys. That was very nice that we didn’t have to buy that stuff since we flew in. The condo was very well stocked with everything you would need for the kitchen. I would have given this place a five star rating but One improvement that needs to be made is an upgrade in mattresses. They weren't horrible But they definitely could have been better. Also I feel That for the amount of money spent, that there should have been more toilet paper, paper towels & trash bags supplied (which we knew in advance but just a suggestion to the owners) Other than that it was a perfect place for our family to get away and Be able to watch the ocean and be steps away from the beach! Departure cleaning is included. Sheets and Towels Provided on Weekly Rentals only. No Pets Allowed. From May 26 until September 7 rentals are Saturday to Saturday only.